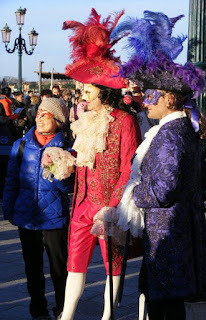 Our Venice Carnival: Who goes? Who dresses up for the Venice Carnival? 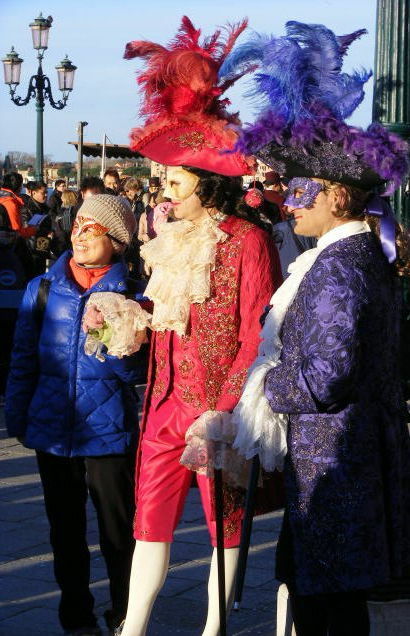 Lots of enthusiastic tourists from all over the world visit the Venice Carnival. They may have different reasons for visiting, but whether they're in costume or not, they are all there to be part of the atmosphere. Some people like to join in, while others prefer just to watch and enjoy. Some people even do both, but on different days. What can you do in costume? There are carnival events on the stage in St Mark's Square and other key locations on certain times and days. 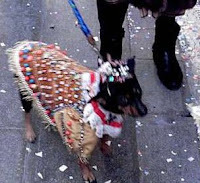 Some of them are costume parades and competitions that you might be able to join in with, while others are strictly spectator events. The official carnival programme guides will tell you what's on, who it involves, and when. Visit the official Venice Carnival web site to get a copy. Do I need a performing licence or permit? The authorities don't employ all the people who dress in costume - although some tourists mistakenly think they do. This means that anyone can join in. Obviously, if you want to do other activities such as performing music or selling things, you're going to need some kind of permission to do that. But if you just want to dress up and join in, that should be no problem. We've never known anyone who was arrested for being dressed as Don Giovanni or impersonating King Louis XIII (at least not in the 21st century), so that's probably a good sign! the spectators and the performers apart. It's totally different in Venice. Yes, there are organised parades, but they're less prominent. For the most part, everyone mingles together throughout the day. We hadn't seen the festivities before the first time we arrived, so we weren't sure what to expect. Would there be many other people dressed up? Would we be the only ones dressed up? Well, we were certainly the only ones dressed up as we left our hotel. The strange thing was, no-one seemed to pay much attention to a medieval prince and princess walking down the 21st century high street and onto the waterbus. Which was a good sign. In fact, the only person who had said anything negative to us was the hotel receptionist, who was worried that we were in our room all morning, and the staff wouldn't be able to clean our room that day. But that's the Carnival for you - some of those costumes take a long time to put on!